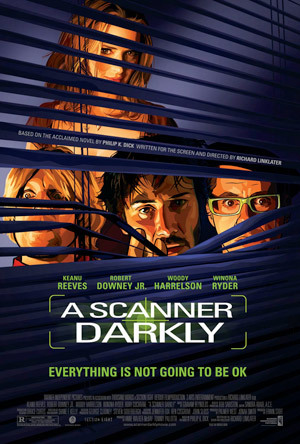 Keanu Reeves, Winona Ryder and Robert Downey Jr. star in sci-fi drama A Scanner Darkly. Working as an undercover cop in a world where almost everyone is addicted to Substance D — a drug that produces split personalities in its users — Fred Arctor sets up an elaborate sting to nab a notorious drug runner named Bob. MPAA Rating: R for drug and sexual content, language and a brief violent image. America’s endless and futile war on drugs has become one and the same with its war on terror. Reluctant undercover cop Bob Arctor (Keanu Reeves) follows orders to start spying on his friends, Jim Barris, Ernie Luckman, Donna Hawthorne and Charles Freck. When he is directed to step up the surveillance on himself, he is launched on a paranoid journey into the absurd, where identities and loyalties are impossible to decode. “A Scanner Darkly” plays like a graphic novel come to life with live-action photography overlaid with an advanced animation process – a method known as interpolated rotoscoping.